Imagine the savory aroma of a tender pot roast cooked in beef broth, simmered with rosemary and thyme. Classic comfort food! We think it’s safe to say this slow cooker pot roast recipe is what Sunday night dinner dreams are made of (or any day, for that matter). Not only does this slow cooker pot roast made with bone broth provide crave-worthy flavors, but it’s packed with nutrients and a healthy dose of antioxidants from sweet potatoes and carrots. Best of all? It’s an incredibly hassle-free slow cooker recipe. 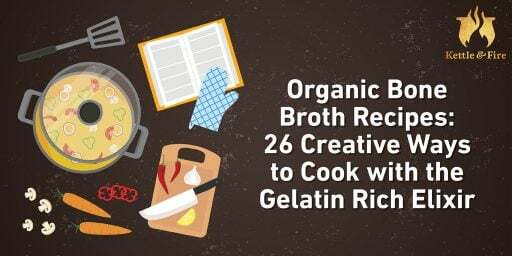 Why Use Bone Broth Instead of Beef Stock? When you use bone broth as a base in recipes like this slow cooker pot roast, you’ll feed your body nutrients like collagen, gelatin, marrow, amino acids, minerals, and glycine, all of which can support optimal health. 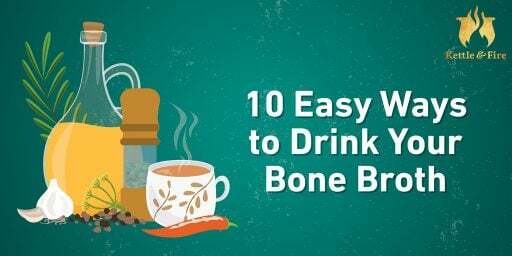 Here’s an overview of the specific health benefits bone broth provides. Bone broth is highly anti-inflammatory thanks to its amino acid profile. In addition to glycine, bone broth also contains proline, arginine, and glutamine, which all help reduce chronic inflammation (1, 2). Inflammation reduction is key for preventing cardiovascular disease, age-related disease, and other chronic illnesses (3). Collagen and gelatin have been shown to heal the gut lining — which is exactly what you need to heal leaky gut (4). By supporting your digestive tract with these nutrients, you can also heal and prevent other conditions that stem from compromised digestive health such as candida and SIBO. Bone broth contains several essential vitamins and minerals in high concentrations, all of which can provide immune system support. One of these minerals is zinc, a powerful antioxidant, which is crucial for normal development and function of cells and has been shown to reduce infections (5). 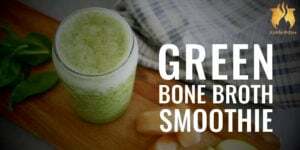 The ligaments and connective tissue found in bone broth recipes provide large amounts of glucosamine and chondroitin, both of which have anti-inflammatory properties that help repair the skin and joints. The collagen in bone broth also contains the amino acids proline and glycine, which are key to combating joint pain and speeding up injury recovery (6). Bone broth may be the perfect nighttime sleep elixir for a variety of reasons. It’s an essential source of magnesium, which synthesizes proteins, transmits nerve signals, and relaxes the muscles to support restful sleep (7). Magnesium supplements are not always easily digested, which is why bone broth is a great solution for relaxing right before bed. It can also help you stay asleep due to the amino acid glycine, an inhibitory neurotransmitter in the brainstem and spinal cord (8). It’s the primary neurotransmitter that inhibits sleep cycle motor neurons during active sleep (9). 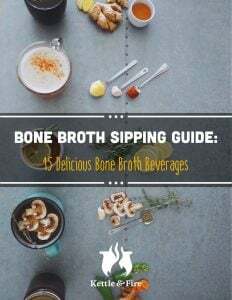 Bone broth recipes can support weight loss, particularly when you implement a bone broth diet. This diet cuts out problematic foods that can lead to weight gain and impaired digestion, such as grains, refined sugar, and legumes. A bone broth diet replaces these foods with high-quality animal proteins and vegetables, and can also be combined with intermittent fasting. Glowing skin is not only a result of the nutrients you eat, but how well you absorb them. You can’t absorb the nutrients you eat without having a healthy gut lining. Bone broth promotes optimal nutrient absorption, as the collagen and gelatin help heal and seal holes in the gut lining (10). A healthy gut allows your body to absorb the vitamins, minerals, essential fatty acids, and antioxidants you need for healthy skin. Collagen also plays a role in maintaining skin elasticity and preventing fine lines, wrinkles, and sagging skin (11). Thanks to its gut-healing properties, bone broth can also naturally increase your energy levels. By repairing the gut lining, you can improve your body’s ability to absorb the essential nutrients that are needed for energy production. Minerals such as calcium, magnesium, and phosphorus all play an important role in oxygen transport and energy production (12). Once the minerals are released, they’re highly bioavailable — which means they’re easy to absorb, even with an impaired digestive system. Now that we’ve covered why it’s ideal to use bone broth as a base as opposed to beef stock or beef broth, let’s get to the slow cooker pot roast recipe! While this slow cooker pot roast would be ideal for a Sunday night dinner for a group, the six servings it yields are perfect for meal prep for one person. You now have lunch figured out for the rest of the week! This slow cooker pot roast consists of fall-apart tender beef cooked in beef bone broth for extra flavor and nutrients, and simmered with rosemary and thyme. Served with sweet potatoes, the hassle-free, easy clean-up recipe is ideal for Sunday slow cooking. Some people add a splash of red wine or Worcestershire sauce (though note most brands are not gluten-free), while others use red potatoes instead of sweet potatoes. The best pot roast is your own version, so feel free to put your personal spin on it! Regardless of what you choose to add, this easy slow cooker meal is always a big hit among beef recipes. A tender beef slow cooker pot roast, cooked in beef bone broth for extra flavour and simmered with rosemary and thyme. Served with sweet potatoes, this hassle-free recipe is what Sunday dinner dreams are made of.